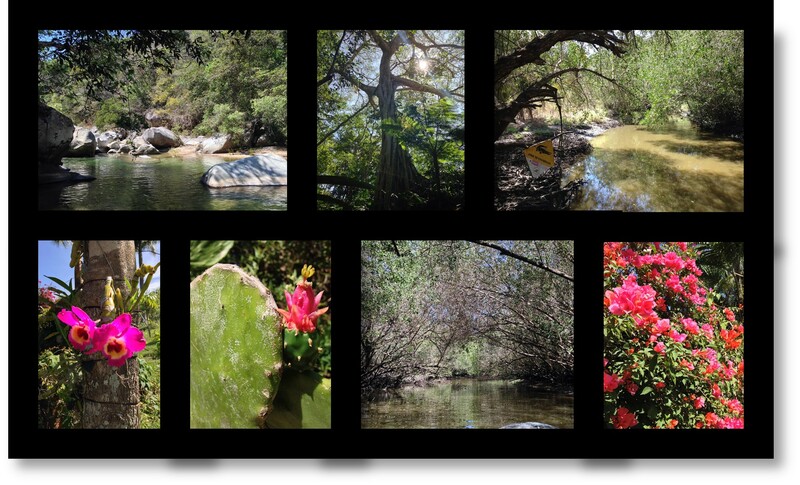 The Sierra Madre Occidental is a rugged mountain range that within Mexico runs from the Rio Grande de Santiago in the state of Jalisco, north through several other western Mexican states including Nayarit. This ecoregion boasts some of the richest biodiversity in North America, and contains two thirds of the standing timber in Mexico. There are 23 different species of pine and 200 species of oak. Tropical and temperate influences converge in this area to provide shelter to a unique and rich ecology and wildlife, to include 300 species of rare orchids, colorful bugainvillea (red, purple, orange, white), more than 350 species of birds, beautiful monarch butterflies, and a large number of interesting mammals and reptiles. The jungle vegetation throughout the Puerto Vallarta area is thick and lush, as abundant sun and summer rain produce humidity that nurtures the entire region. A diversity of trees can be found in this zone such as Amapa, Chilte, Palo de Brasil, and produce tropical strong wood (walnut, parota, cedar amapa, primavera) that can be used to make canoes and hard-wood furniture. Exotic fruit is also plentiful in this region to include coconut, pineapple, macho banana, guava, guamuchil, mango, jacka fruit, watermelon, and avocado. Mammals native to the area include: jaguar, jaguarundi, black bear, ocelot, margay, white-tailed deer, armadillo, badger, racoon, coati mundi, chipmunk, deer mouse, and rock suirrel. The Mexican grizzy that once roamed these mountains are now thought to be extinct from the region, and the Mexican gray wolf is one of this area’s most endangered species. Reptiles and amphibians flourishing in this region include: Green iguana, spiny-tailed iguana, Mexican beaded lizard, and crocodiles. There are at least three species of rattlesnakes to include ridgenose, twin-spotted, and rock rattlers. Unique and colorful birds of interest are: Amazon Parrots, Green Parakeet, Tropical Kingbird, Black-throated Magpie Jay, Yellow-winged Cacique, Blue-footed Booby, Great Kiskadee, Green-striped Brush Finch, Coppery-tailed Trogon, Eared Trogon, Violet-crowned Hummingbird, Mexican Jay, Spotted Owl, and the Golden Eagle. In Banderas Bay, and the Pacific Ocean that surrounds Puerto Vallarta, marine life is abundant. There are tuna, snapper, red snapper, blue marlin, black marlin, sailfish, and seabass. A variety of sea turtles swim the bay, and the shores of Banderas Bay are actually a turtle breeding ground. The government has established turtle conservatories and release sites, and strict laws are in place to protect these endangered animals. Banderas Bay is a dolphin breeding area, and therefore it is very common to see bottle-nose, spotted, and dusky dolphins swimming and frolicking about near Puerto Vallarta. Dolphins are very curious, friendly, and playful by nature. To the delight of onlookers, dolphins will often swim alongside boats and kayaks. For viewing and interacting with dolphins in their natural habitat, complete information is available on our Dolphin Swim Programs page. Banderas Bay is also an important breeding and calving ground for humpback whales. From December through March, in the vicinity of Puerto Vallarta, whales are often spotted swimming and leaping in the warm turquoise waters of Banderas Bay. These incredibly beautiful creatures often treat observers to their breaches, songs, courtship displays, and other innate behaviors. Lucky spectators may actually see a calf being birthed, and the sweet tenderness that is shown between mothers and their calves. Government regulations protecting the whales are strictly enforced. There are a variety of responsible tour operators that run excellent whale watching programs for viewing these gentle giants. Within Puerto Vallarta and Banderas Bay there are numerous adventure tours and excursions which give visitors excellent opportunities to explore this incredible area. A must-do activity for all ecology and wildlife lovers is a trip to the Vallarta Botanical Gardens, 30 minutes south of downtown Puerto Vallarta. 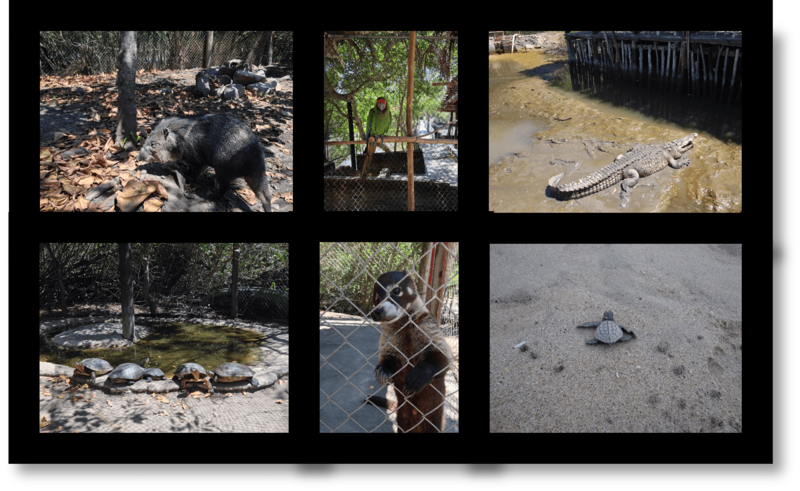 Another excellent opportunity to immerse yourself in nature is the El Cora Crocodile Sanctuary in Nuevo Vallarta, a short 15 mintues north of Puerto Vallarta’s international airport (PVR). An excellent way to view the jungle canopy is by zip line, which is an exciting and thrilling adventure!